He is a good person.He won an gold and he gos to a club at ext 9.He showed us some cool thing.He's an good and he is in grade 9.Thendo is a boy that loves karate and his mother do not like that sport because it dose not give money.But the is some one that is looking after him.She is always their for him.I wont cell her name . If i was his mother i will be the mother that a child will like to have. His mother is a good person but she is not good to help his son to follow his dream.I almost forgot something he lived at thanyi where he sated karate but sill his dream.His club was going to move to ext 9.But there was a problem so the club was going back to thanyi so he could not go back because he had to live there .So he whet to a now club. Thando told us that he is from extention 9.He is a person who likes karate and when he was young he liked to watch karate movies.When he started karate he was 11years old and at that age he was learning in C.M.Vellem.His mother never supported him with his sport because he new that the sport that he was doing didn't bring money at home.He did the karate at tantyi.Then he had that in extention 9 there is a new karate club. Then he continued doing his karate in extention 9 then the first senseia fought with his new senseai took his karate suit then he stopped doing karate for 1year. When Thandu was here he thought us about his journey in karate when he started it in 2009 he was 11 years.When he started it he was he trained in Tantyi location in a MAKANA Macipality hall.In 2013 he moved to extention 9 hall were by he was trained by Sensei thats how his journey started.In 2014 he was studying in C.M VELLEM PRIMARY SCHOOL were by he started awarenet were he met Terry a sports lady.Terry and Thandu were both in sport so Terry helped Thandu in karate to pay some fees to go to some tonaments,because thandu's mom was unemployed. Thando is a boy who likes karate sport. he lived in extension 9 .he likes to watch karate movies.he started karate when he was 11 years old.he is learning at Nombulelo high school.his mother didn t like the sport that Thando was doing and Thando s mother was not support Thando because of the sport that Thando was doing.At first he was doing karate at Tantyi. His mother didnt like the sport that he was doing because it doesnt bring money so his mother will just listen to Thando when Thando is talking about karate. Thando told us a lot about Karate, he also showed us the things that are done in Karate he told us about his first tournament.He said he did not do very well because he was fighting with big guys on the tournament he said he was beaten but he said on the next tournament he will do very well really he did it he met the same guys again and he won it he got 2 Gold medals and 1 Silver for fighting and golds for showing things that you have learnt before. He said we must go outside and he showed us his cuter and he told us more about his sport karate he said you must not drink beer when you are doing a sport because your career will go down and fail a lot of medals and your coach will not be interested in you he will find someone else for his or her money Thando also came to the lab and showed us his club members and his coach and the one who is creating tournament. When we were going home he told only me about his mother who don't like his sport because it is not bringing money at home and he thinks he would be injured and his mother will not have money for him to get good doctors.He asked me which sport that i like i said i like Boxing and he said are you doing it,i said i once did it but my mother did not like it because it was not bringing money too now i am doing doing soccer at my location and i am doing very well. Thando is a talented boy aged 17. He plays Karate and started when he was 11.His mother did not like the sport and still hates it because it doesn't bring money home. His father left him and her mother a long time ago. Her mother left her job and know they are using pension money. They use the money for paying school fees, paying the bills and for food. He first learnt at C.M Vellem.Thats when he started to join the awarenet.His Karate teacher gave him a new Karate suit. There was a tournament coming up at Rhodes University and he won gold medals but not all of them. there was a tournament in Cape Town but he did not have the money to go there, then came along Terry .Terry is almost like a second mother he says because, she helped her with his transport fees. From this story i have learnt that you need to believe. Thando taught us about the different types of karate.He even counted in japan.he helped us to see the difference between sport and defensive karate.He said to us we should not let someone discourage you even if you like that person.You should follow your dream. He told us he had great achievements.We went outside and he showed his cutter.Thando said his mother did not support his sport.He started when he was eleven.He even said that he was about to go to Ireland but he was discriminated because he was the only black person and there were only whites. He won on flying colors.On 2013 he met Terry.Terry is a women who likes sports.She had about Thandos diffeculties.She was insipered and she helped Thando.Thando said that the sport you like your follow it. Thando taught us about the different types of karate.he told us about his sensei.he told us about his achievements.he started karate when he was 11.his mother didn't support him in his favourite sport.he counted in japan.he did karate at Tantyi. he showed us pictures of his sensei.he showed us a cutter.he won a gold medal, a sliver medal and a bronze medal. he met terry.terry is a woman who likes sport.when was doing awarent.he was discriminated in the tournament. he won flying colours in 2013.when his senseis had a fight.he stopped karate for 1 year. 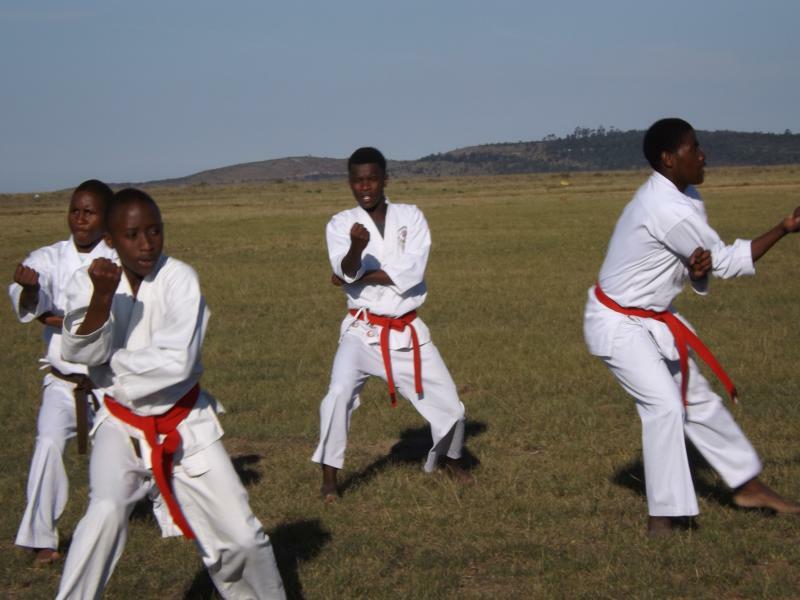 Thando a young man who live in E.X.T9 does karate as a sport.he learnt karate from a very young age and since then was attached to it.He told us that his desire for karate started when he used to watched karate movies.So he started at the age of 11. He told us about about his first tournament and how he lost against those big guys and how he was scard.His second tournament was how ever a success,he still fought against those very same guys.he got quiet a number of medal both gold and bronze.His future is looking bright and there's a lot for him to achieve. thando was playing karate. He was teling as that she was playing in extanshion 8 .She was helped by terri so that she can go and play with other people so that she can win for the group . She played when she was 11 yers old . she was acheving. Thando came to talk with us about Karate. he first started to train in the Tantyi Hall, he was trained by his Sensei Zwelakhe. His sensei told him how to count in Japanese and he showed him some moves. Thandoxolo started in the year 2009 when he first started to train karate. He said Karate taught self-defense. He showed us some of his interesting. A boy named Thanduxolo paid us a visit in Good Shepherd Primary school.He told us as grade 7 learners about his career of karate how he started training,how he won his medals,who he fought with, who trained him.He has a really bright future that is the first thing I thought of when he told us about his career. One of the things that I really liked/enjoyed, it was when he taught us to count in Japanese. I have to say this embarrassing word because i have no choice I've already forgot those numbers.His story is very interesting because he is still young and he has managed to make his future this successful.What am trying to say is that he has a bright future,he is an example to many South Africans and has raised a level for Eastern Cape. Thanduxolo came to talk to us about Karate. He told us that he started karate when he was 11 years old. When he started karate, he trained in Tantyi hall. In 2012, he moved to extension 9 hall where he was trained by his new sensei. He was studying at C.M VELLEM when he started awarenet and met Terry. She sponsored him for a karate competition. He won gold, bronze and silver. What I liked about his talk is when he demonstrated a few moves for us and when he thought us how to count in Japanese. He thought us a few lessons about fitness and thought me a lesson in life TO NEVER GIVE UP. Thanduxolo is a very well mannered teenage boy.He told us that karate is about self-defence and making peace.He started karate at the age of 11 years old at Joza Tantyi Hall,he was trained by Sensei Zwelakhe.He went to challenges and fought with the age group 15-17 years,when he was 15 years old.He won metals and was awarded best sport man of the year at 2013.He demonstraited for us Kata and told us how to court in Chinese. A 17 year old boy called Thanduxolo came to my school on friday.He talked about his journey about his fights.he demonstated a few moves and showed us one or two things.He said he started karate at the age of 11 and the year was 2009 ,he started karate at tantyi . And then in 2010 the extension nine hall was officially open .In 2013 he started karate at the extension 9 hall ,the he was being trained by sensei .and then he trained the ,in 2013 the started going to tournerments.Then the he fought fights and recieved medals ,he fought with different countries not locals only. soccer is a favarite sport because you can find the school that you can play soccer until you finish at school .many people they like soccer because soccer is the sport that is very easy for small children . Soccer is a sport that i am going to play.Chriss as here yesterday saying we shoud have a sport that we playing to halp as fit and strong.chriss also told as that the are three things in life we have to have school;church and sport.i am going to play soccer in my school. playing soccer can open many doors for you.soccer is one of my adorable sport but through all that i leanerd that you must respect each other in your team.soccre can make you a better person at the end of the day by making you a beter person to you roll models outside there.when you play soccer you can have a chance to visit other countries.i learnt alot from mr chris that in what ever you do you must have patience coz not everything comes easlyin life,chris shared his story with us that he was poor the time he was growing her parents weer not earning much at work he could go to school without having a break fast.then on 1998 he formed his own soccer team which is for girls only.he told us that some of the girls come from poor families also but they dont give up so easly.some of the girls went overseas to play soccer and some just went to play with the banyanabanyana which is so wonderful. chris seems as a good person whose willing to help every girl out there.to me he is a role model and to everyone who likes the sport its not easy to work with girls as a man it could hard to couch girls sometimes but chris have the patience to do all that god just blessed him with a wonderful job.may your wishes come throu sir and may god bless you with many more years. bale is my rollmodel in soccer becouse when he play soccer on tv i just want to be like him .bale is my greatest soccer player he has a good skill and a speed to run and he is not like other soccer players if they want a goal they will not pass the ball until they got the goal when he was signed by real madrid he was happy to be signed by the good team when he was explaining to the tv presenter he sayed it was a dream come true he was a first young man to wear number 11 .when he train he start in the morning to 8oclock in night. My favourite dish to prepare is simple fruit salad. Cut all your fruits in squares. Place your fruits in a round bowl than drizzle lemon juice on top of the fruit mixture. Serve with yogurt or juice. 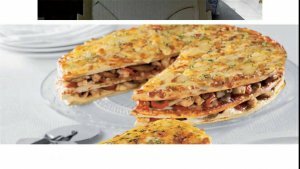 This is my favorite food preparation: Debonairs Triple Decker. 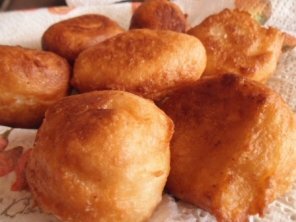 It is my favorite food because My family especially my grandfather. I just like it because of the taste. Good food gives you the long and healthy life. but my good food that I think gets me going is fruit every day. As they say an apple a day keeps the doctor away. VEGETABLES and MIKE is one thing I can’t go to sleep with out. Because it keeps my blood fresh and helps me think. Vega and milk helps a lot when you are a rugby player. MIKE helps our bones to grown and be strong while the Vega helps our blood to flow and helps with our thinking. Good eating habits are really good in such a way that you can even know what you will be eating or what would you need to eat when you are a sportsman/sportswomen .When you are on a daily diet you eat certain type of food e.g you can not eat bread or any sugar while playing sports .In this way you can live a healthy life and you can live longer. Bad eating habits are bad because they can tempt you to eat sweets &amp;amp;chocolates a lot than eating healthy green food. They are sometimes good for our bodies because when you are injured and you are at the hospital they give you to much of energy which can give you the ability to do some work. Junk food is nice because it can give you too much energy than just being weak and when you are getting ready for sports match or practice. EATING FRUIT WITH YOGHURT THAT IS VERY HEALTHYAND EATING VEGETABLES,CEREALS,DRINKING WATER,AND EATING OTHER HEALTHY THINGS THAT WILL MAKE YOU TO BE FIT AND STRONG AT THE SAME TIME. THEY ARE FRIED CHIP,WHICH IS NOT HEALTHY AT ALL BECAUSE IT COULD MAKE YOU TO HAVE HEART BURN. SO AWESOME FOOD IS NOT RIGHT IF YOU OVER DO IT. GOOD AND BAD EATING HABITS..
YOU MUST EAT GOOD FOOD BECAUSE YOU WILL BE HEALTHY IF YOU EAT BAD FOOD YOU WILL GET SICK.YOU MUST EAT FOOD SUCH AS FRUID,VEDGETABLE ,PROTEIN AND DRINK WATER THE TIME.AND DO THINGS SUCH HAS WHOLE GRAIN ,CHECKING YOUR WEIGHT AND RUNNING ALL THE TIME.AND YOU SHOULD NOT EAT FOOD SUCH AS SUGAR,TAKE AWAY,DRINK COKE,SWEET AND CHOCOLATE .AND YOU SHOULD NOT DO THINGS SUCH AS SITTING DOWN INFRONT OF TV AND EAT ALL DAY.YOU WILL HEALTHY IF YOU FOLLOW RULES SO IT’S A WARNING FOLLOW THE GOOD STUFF IF YOU WANT TO BE HAPPY. I ate health food because i want to gain some energy to keep my self healthy.I also ate healthy food such as speenich,water,poriege.In the morning time i also ate bread and tomatoes all the day.I dont want to ate fats and oils to much because you will became fat forever.We have to train our self to known that its an health food so that is why our body alway fresh because we ate health food . healthy eating habits is not confusing or as restrictive as many people image.The essentail steps are eat mostly foods derived from plants like vegetables,fruits,whole gains and legumes[beans,peas,lentils]processed foods .here are we guidelines for building our heathy diet.we can eat healthy food is because we can get energy and dont think when you eat bugurs you are going to be fit or get energy. Before going to the ground i had eat two slice of bed.There when it's first half our coach gave as one fruit that is banana.When you play soccer you must have three breaks that two is for water break and one is for halt time.Banana is a healthy fruit for soccer players because banana is not haveng too mush water.During the water break you must drink a energyrade that will gave you a power so each and erverytime you going to play soccer you must have a fruit.If don't have it then u must drink water not to much water because you will fill the pain in your stumuch and that thing will keep you out of the game.It is so important to eat healthy food before play your sport. i eat healthy food becouse i want to gain energy and focus to what im doing andi play soccer thats becouse if you dont eat healthy food you will not be able focus or to gain energy and thats why eat healthy food to be strong an keep my body healthy and my mind fresh and i need water ,vergetable ,fruit ,meat speenach and you need to make sure you eat healthy food all the time when you are going to play soccer. I eat healthy food because i want to gain strength and focus on what i am doing. The kind of food that i eat are fruit,vegetable and drink a lot of water and other stuff that is healthy.To get active on the sport i play you need to have energy and be fresh so that is why i must eat healthy food and exercise every single day.I eat heathy food most of the time when i wake up in the morning,and also i watch what i must eat and not.The food that i must not eat are these stuff who makes you fat,like i eat meat but not most of the time. In my sport soccer is all about fitness and you must be strong so in my sport you will have to eat healthy so that your bones have to be strong and not get easily injured when you playing a game.As a sport person you mantain your health issues so that you must not get so often tired easily before maybe ten minutes.So as my knowledge you will have to eat fruits every time when you going to the match field and other things you will have to eat papa,paste and all the protein and for you to keep your shape you must eat meat. My favourite sport is netball.The reason why i love netball is because i love to play with others and on it there is no fighting and it is relaxed.Like relaxed at there sea and the much thing you do is to run so much yo catch the ball and if you know me i giveup on netball know am on the choir so the thing i love is music make me proud of my self. my favourite sport is tennis i like tennis very much most of the chidren love tennis and she make me fellee happal .my family she love tennis and and one day i wish to de a tennis team and after school my friend his neme phelisa. My favourite sport is cricket. The reason why I love cricket its because it is so calm and it is so relaxed. In cricket there is no fighting like other sports. My favourite player is Hashim Amla. The reason why I love Hashim Amla its because he is a nice player and he is good at what he is doing. When he plays he concentrate and always makes the team proud. Good player he play n.o 8.
my favourite sport is soccer and love to play soccer and my fondrs. MY FAVOURITE SPORT IS SOCCER I LOVE SOCCER S0 MUCH. THE REASON I LOVE SOCCER IS BECAUSE IT KEEPS ME FIT AND STRONG. I ONLY GO TO SOCCER PRACTISE ON TUESDAY’S. ONE DAY I WOULD LIKE TO SEE MY SELF AS BANYANABANYANA THE SOUTH AFRICA SOCCER TEAM MY ROLE MODEL IN SOCCER IS AMANDA DLAMINI SHE IS THE TEAM CAPTAIN. AND I WOULD LIKE TO SEE MY SELF IN TOUNAMENTS ONE DAY . I WANT TO SEE MY SELF IN TELEVISION..MAKE MY PARENTS PROUD ABOUT ME AND MY OTHER SIBLINGS.I KNOPW SOME PEOPLE DO GOSSIP ABOUT ME COZ AM A GIRL AND I LIKE SOCCER BUT I DONT CARE BECAUSE THE MORE THEY GOSSIP THE MORE THEY GIVE ME POWER.. I LOVE SOCCER SO VERY MUCH. "Arjen Robben (Dutch pronunciation: [ËÂÂÉÂÂrjÉÂÂn ËÂÂrÉÂÂbÉÂÂ(n)] ( listen); born 23 January 1984) is a Dutch professional footballer who plays for German Bundesliga club Bayern Munich and the Netherlands national team. Robben has appeared at the 2004, 2008 and 2012 UEFA European Championships, and the 2006, 2010 and 2014 FIFA World Cups. He is a forward who usually plays as a left or right sided winger. Robben is known for his dribbling skills, speed, crossing ability and his accurate left foot long-range shots from the right wing." I like Arjen Robben because he is my footballer and he knows everything about soccer and he is so good in soccer also he is playing his right wing well. I understand that a person should fight for his national team to win me 2 when i want play soccer in my national team South Africa.He is a good runner on that wing so that's how his team win. He's Chelsea debut was delayed through injury, but upon returning to fitness he helped Chelsea bring home two consecutive Premier League titles, and was the FA Premier League Player of the Month in November 2005. Robben moved to Spanish club Real Madrid for €35 million. In August 2009, Robben transferred to Bayern Munich for a fee of around €25 million, scoring two goals on his debut. In his first season in Munich, Bayern won the league title, Robben's fifth league title in eight years, and Robben scored the winning goal in the 2013 UEFA Champions League Final. After his first season with Bayern, Robben was also named Footballer of the Year in Germany. 'On 11 July, Messi was named on the 10-man shortlist by the FIFA technical committee for FIFA's Golden Ball award for the tournament's best player. The World Cup final match on 13 July, in a repeat of the 1990 final, was billed as the world's best player [Messi] versus the world's best team [Germany]. In the 29th minute, Messi had started a play which led to a goal by Higuaín, which was correctly ruled offside. Messi missed several opportunities to open the scoring throughout the match, in particular during his breakaway at the 47th minute, when his effort was put just wide of the far post. The game remained scoreless until German substitute Mario Götze scored in the 113th minute, then in the last minutes of extra time Messi's free kick sailed over the net, and Germany won the game 1-0 to claim the World Cup"
I like Messi because he helps his team and country.He is a spirit booster.He was even the same month I was born.Helps Argentina to win on the 2014 fifa world cup.Barcelona does not score or sometime lose if messi is not there.He goals last minute goals.Messi always happy and like to help other players.Even when he is not jelous of his experience.Even if he loses a match he would help them like when a player has not been on an event. "Messi helped Argentina win the 2005 FIFA U-20 World Cup, finishing as both the best player and the top scorer (with six goals). In 2006, he became the youngest Argentine to play and score in the FIFA World Cup, and won a runners-up medal at the Copa América in 2007, in which he was named young player of the tournament. In 2008, he won an Olympic Gold Medal with the Argentina Olympic football team. At the 2014 World Cup, he led Argentina to the final, winning four consecutive Man of the Match awards in the process, and received the Golden Ball award as the best player of the tournament. In 2013, SportsPro rated him the second-most marketable athlete in the world. His playing style and stature have drawn comparisons to compatriot Diego Maradona, who himself declared Messi his "successor"
I like Messi because he plays very hard for his team to win a match and i like him because his the top goal scorer. he won an Olympic Gold Medal with the Argentina Olympic football team.he was nominated for the UEFA best player in Europe ,along with cristiano ronaldo and frank ribery,for a third consecutive year. Nicki Minaj's real name is Onika Tanya Maraj.She was born in 8 December 1982. She is 32 years old.Nicki Minaj is a Trinidadian, American rapper ,singer and songwriter.Born in Saint James,Trinidad and Tobago and raised in Jamaica,Queens,New York, Minaj earned public attention after releasing three mixtapes between 2007-2009.She signed a recording controct with Young Money Entertainmentin2009. ''Van Persie was a Dutch youth international, having represented the Netherlands under-17, under-19 and under-21 sides. He made his senior international debut in 2005 in a friendly match against Romania. One month later, he scored his first senior international goal in a 4–0 win over Finland. Van Persie has 96 caps and has scored 49 goals for the Netherlands, making him their top scorer of all time. He has represented his country at the 2006, 2010 and 2014 FIFA World Cups, and the 2008 and 2012 UEFA European Championships. I like Van Persie because he is my best player in the world.He works hard for his team to win every match they played in the league.He likes to do skills in matches he plays.He made his breakthrough at another hometown club Feyenoord,where he spent three seasons and won the 2002 UEFA cup.Van persie moved to Premier league side Arsenal for 2.75 million in 2004 as a long term replacement for Dennis Bergkamp. Venus Williams was born in Lynwood,californina to richad Williams and Oracene price. I like Amla because he is my cricket he knows everything about cricket . He is my best peson in the word.And he is my good . Amla started 2010 in February against India in a two-match test series against India in India. In the first test he scored 253* as South Africa reached 558. After this a superb bowling performance from Dale Steyn meant that India were bowled out for 233 with Steyn bagging seven wickets. India forced to follow-on were bowled out for 319 as South Africa won by an innings and six runs. In the second test match Amla made 114 before being caught by MS Dhoni. Despite Amla's century the remaining South African batting order could only manage 296. India batted and scored 643 with centuries from Virender Sehwag, Sachin Tendulkar, VVS Laxman and Ms Dhoni. The South African chase collapsed poorly but Amla still managed another century scoring 123* as South Africa were bowled out for 290 and crashed to an innings defeat. After this Amla toured the West Indies for 5 ODIs and three test matches. Amla top scored in the first ODI with 102 as South Africa coasted to a comfortable victory. He followed this up with 92 in the second ODI as South Africa again sealed a 17 run victory. In the third ODI, Amla scored 30, but in the fourth ODI he returned with a century by scoring 129 off 115 balls. He made 45 in the fifth and final ODI before he was run-out by Kieron Pollard as South Africa won narrowly by one wicket. Zahara is my idol because of his songs and her skills.He started singing since 2011 and at the first time I was interested of her songs because they encourages every learner to focus on with school and be someone who want to be in the next years.She told us about her future and he don't want any of a learner to be like her.She told us that she come from rural areas she was looking after her father's cows even though she is a girl but now she is the person who is there were those who were better than her and she told her self that she will never give-up but those are down right now they drunk ,they do everything. She told us that she was go to school with foot in the winter time.She have skills for guitar but there's no one who can help her and she try to play with until this time.And she had dreams of her singing and she told her mother and prove her self for that. my idol is Taylor swift although her birth name is Taylor Alison Swift. I have never seen someone who cares about other people. she has influenced me in so many ways.I have so many pictures of her with homeless people donating things and enabled kids.Taylor Swift was born in 1989 on the 13 of December. She was raised in Wyo-missing, Pennsylvania, swift was then moved to Nashville, Tennessee, at age of 14 pursue a career in country music. She signed with the independent label Big Machine Records and became the youngest songwriter ever hired by the Sony/ATV Music publishing house. One of Swift's earliest musical memories is listening to her maternal grandmother, Marjorie Finlay. In her youth Finlay was a television host in Puerto Rico. At the age of nine, Swift became interested in musical theatre and performed in numerous Berks Youth Theatre Academy productions. She also traveled regularly to Broadway for vocal and acting lessons. Swift later turned her attention to country music—Shania Twain's songs made her "want to just run around the block four times and daydream about everything." She spent her weekends performing at local festivals, coffeehouses, fairs, karaoke contests, garden clubs, Boy Scout meetings and sporting events. At the age of eleven, after many failed attempts, Swift won a local talent competition and was given the opportunity to appear as the opening act for Charlie Daniels at a Strausstown amphitheater. After watching a Behind the Music episode about Faith Hill, Swift felt sure that she needed to go to Nashville, Tennessee, to pursue a music career. At the age of eleven, she traveled with her mother to Nashville to submit a demo, of Dolly Parton and Dixie Chicks karaoke covers, with record labels along Music Row. She received label rejections and realized that "everyone in that town wanted to do what I wanted to do. So, I kept thinking to myself, I need to figure out a way to be different." my sporting ideo is siphiwo tshabalala because he make sure that every day he play a soccer he scored. simphiwe tshabalala is a concetrating player who dont dissapoint their charecters.simphiwe tshabalalais a good player and a nice player who wear a t shirt written number 14at him back to show that he is a striker. when you watch soccer with simphiwe tshabalala you will realise that every second he want to score many goals he dont want to lose on hi team.simphiwe tshabalala he is very skilled on soccer its look like every day he pratise to play soccer but not.simphiwe going to many places because he very vey skilled man on soccer.my wishe for you tshabalala to be strong and dont giveup on what god gives you because some people wish to be like you one day your works are very beautiful in the hall south africa. My sporting idol is a rugby player.His name is Morne Steyn.I've liked Steyn since I was five years.He is the best player to me and he encourages me so much.He is still playing for South Africa and he still have that power.Many people are sport players,because there is no famous sport player next them who can mentor them,they end up letting their sporting dreams go away So to me Steyn is my mentor,all though he is not next to me. my sporting idol is Patrick Lambie.the reason i like him is becouse he is smart and clever also caring.Patrick is a humble person he inspiers me alot.one day i wish i can meet him and ask him lots of questions,he can give me words of wisdom he can also thought me alot about the rugby becouse one day i want to see my self as a role model tothe next generation.as we all know that sport can open many closed door to a person.rugby is something that can help you to heal it can make you feel happy if you were sad.Lambie is a role model to others too not only to me every body who plays the rugby sport would like to meet the guy one day.Lambie is the right person to make example of to the young stars of South Africa. With love to Patrick Lambie. is very easy sport and we have matches on saturday so that is why i almost go to the prectise.We prectise every day so that you will never get unfit.basketball is the sport that all people might like to play.basketball is the sport that has money and basketball its give a lot of things that you look for.I watch it all the time my favourite team is celtics. My sporting idol is Lionel Messi and he's home country is Argentina.He is my idol because he is the best player in world and everyone who knows him knows that he is the best and in the future I just want to be like him and I know that I will not be just like him but by the things he archieved in soccer I just want to be like him. Since my favourite sport is Cricket so my sporting idol is AB De Villiers.The reason why I admire this guy is because when he plays he is so calm.If I could get time or spend a day with this guy I would ask him how one could get opportunities to be at the place he is now and where one could get people like coaches and mentors just to help them succed in their sporting life just in case one gets an opportunity to go and learn more about the sport he/she is playing. Since i was in netball my sporting idol is my self the reason why i admire my self is becouse i used to play netball since i was in grade;4 and my coach was MRS;Lukhwe she use to teach us when we were in grade;4 and that time i was 9years old.MRS;Lukhwe she was forcing us to play netball but when i grow up i see this that i like it even when i was in grade;8 i saw that am really likeng it and now am in grade;9 i like it and now am in grade;9 i like it and i love it.Am calling it my hobbie but when i was young i didn't like it becouse it was being forcedand now and older i call it my hobby i thank you mrs lukhwe for giving me sport that i didn't like but i like it now i love my self for being a nertball player. From our last session we were visited by Chris who is a soccer coach.He owns a team which is only for the girls.So he told us about his team which practises here in the township.I couldn't believe it when he told us that the team even went to germany and there were two girls who went to Gauteng and then my interest in soccer got bigger because I didn't know that soccer could take you places like Germany.He also gave us an advace that ther are only three things that could lead to a better life.First you have to go to church and then secondly you need to go to school and learn hard and then thirdly you need go and do sports because there are lot of opportunities you can get through sport.Also he told us that the team practises only on tuesdays and on thursdays and then when the girls are writing exams they don't practise they let them focus on their studies because education is one of the things that's important. Soccer is important to may people for different reasons . Some peolpe like to take part in soccer. Athers spend a lot of time watching soccer . Even if you do not enjoy soccer,it is part of every society is some way. AND WE YOU PAy soccer you mast have a respectn.And wen you pay soccer you mast read your book. I was proud that day when chris tell me abount sport . and i was happy chris tell more abount sport . CHRIS say next year two grls they go to DURBAN.AND that day they do warm up. Chris say when was young was so poor but soccer was change my life. Chris say in G.town my soccer term is the best term all in Chris term is grls only. And when ask to Chris the boys if want to play soccer in your term say no boys..
Thanduxolo is a boy who isdoing Grade:10 at Nombulelo Secondary School.He started doing karate in 2009.He enjoys doing karate and karate is part of his hobbies.Thanduxolo came to visit and talk to us about karate on the 8th of May. He told us many things.He told us about his life in karate ,he told us how to defend yourself when you are on the streets,he told us his about his grading.Thanduxolo also teached us how to count in Japanese.Thanduxolo said that he firstly learnt how to do karate at Makana Municipality Hall than he went to learn more karate at Ext 9 at Joza location.He also said that he went to tours where he had to represent Eastern Cape and he also represented South Africa.Thandoxolo also explained to us how he graded to next belt colours or something.He told us that he is on second brown belt(which i sreally cool). He worn most of his first rounds at competitions but he struggld to win in second rounds but he finally worn after some years of losing some of the second round fights in competitions. talk about thanduxolo about karate. Thanduxolo is a talented young boy with skills.Since the day Thandu came at our school he became an inspiration to us.Thandu is doing grade 10 at Nombulelo high school he started karate when he was eleven years on 2009.He was trained by sensei Zwelakhe at Tantyi hall.He showed us how to do kata and fighting.He said he was on many fights and he told us about his fight that he won and lost.He told us many interesting things about karate. THANDOXOLO.Thandoxolo was a young boy who loved sport the spot thet he like is karhati he started karati at a young age he was 11 years old on 2009 he started his fest fight on the year of 2010 he fights again he did not win becouse he was fihgting with the big guys. After that on 2011 HE worn his fest merdal it was a brons and he was heppy about it and again on 2013 he worn another brons merdaln and he was heppy about it. Afther that he sed he is going to demonstrate same moves that he likes and that was so cool then i wish i can be one of them who knwo karati. Thanduxolo he was teach by MR Zwelakhe he sarted tranig by Tanki Holl and then the training at extension 9 at his street and thats way he is the best. On Friday the 12th of June we had our annual Health and fitness Sports day held partly at the Joza Youth Hub and a Sports field close to the Hub. Varies donations were received for this day,the donors were Run/Walk For Life donating R500 and water bottles,Madhatters for a big cake and Albany Business Machines for School stationary. Over 30 kids participated in this, learners from C.M Vellem Higher Primary School and Seventh Day Adventist School and a few from Nombulelo Secondary School. The cash that was donated by Run/Walk For life was used to buy some food for the learners and each received a goodie bag for attending the fitness day. After enjoying some food everyone walked over to the field were we started our program of the day. First on our agenda was Thandoxulo Rooi and he group from Joza Karate Club demonstrating some Karate Skills and fighting. Brilliantly displayed every move was done on time and in sequence. They were warmly applaud from there good display in Karate. After the Karate demonstration we did the Mr.and Mrs Fitness were a few boys and girls participated in.The first fitness test they had to do was as many sit ups as possible in 45sec followed by push ups and star jumps the boy and the girl with overall best score was the overall winners.The overall winners was Mr. Fitness Thanduxolo Rooi from Nombulelo Secondary School and Miss.Fitness Zezethu Fikani from Seventh Day Adventist School. In the second term of school, we started a health and fitness project, during which we teach the learners how to keep fit and healthy by playing sport. The schools participating in the project are Ntaba Maria PS, Good Shepard PS, C.M Vellem HPS, Seventh Day Adventist School, Archie Mbolekwa SS and Khuhliso Daniel SS. What training do you do to keep fit in this sport? How many times a week do you train for your sport? We also put the theory in action and played some soccer and netball, which are the two sporting codes that the learners really enjoy participating in. We trained to build up some fitness for the awarenet Health and Fitness Day on Youth Day. 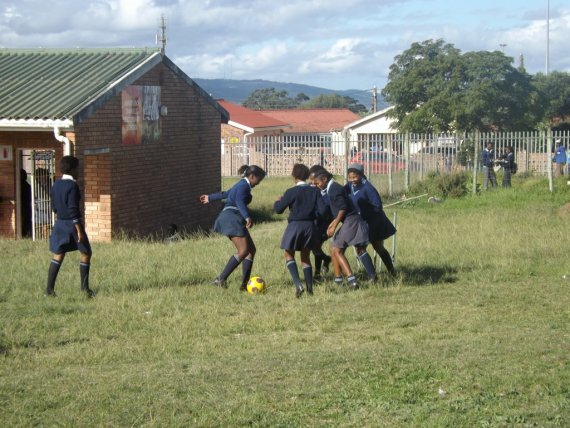 Two soccer balls were donated by Albany Sports from Grahamstown. The sporting activities happened on the school grounds. Photos were taken during the playing of the different sporting Codes. Finally, motivational talks were also given about keeping motivated in sport and how to become the best you want to become in sport. Ntaba Maria PS learners had the opportunity to listen to Rooi Rikhotso talking about how to keep motivated in sport while still focusing on academics, not to get involved in wrong doings and wrong friends. Rooi is a top runner from Grahamstown (originally from Limpopo) and works as a security guard. The learners enjoyed Rooi’s talk and found him very inspirational. Seventh Day Adventist School and Good Shepard PS had the opportunity to listen to Thandoxolo Royi talking about his sport, Karate. 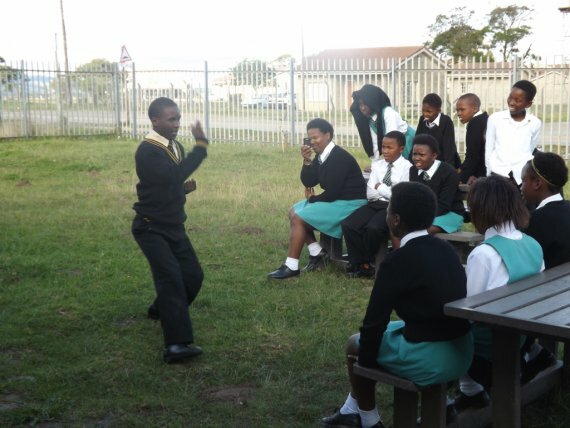 Thandoxolo is a Grade 10 pupil at Nombulelo Secondary School and also an active awarenet student. He is very good in Karate, working towards his Black Belt in the next few years. The learners found him very inspiring as gave a very good insight to the world of Karate. They even had the opportunity to learn a few karate moves as he demonstrated them. Chris Tobela motivated C.M Vellem HPS with his Soccer Coaching skills giving them advice how to achieve in Soccer. Chris works at Albany Sports and is a soccer coach for the ladies soccer team called African Connections. They thoroughly enjoyed hes talk. Blogs were written about all the motivational talks. The new few weeks we will keep training and also learn about good nutrition until the awarenet Health and Fitness Day. During this day, we will have soccer tournament and the learners can compete for Mr. and Miss Fitness. 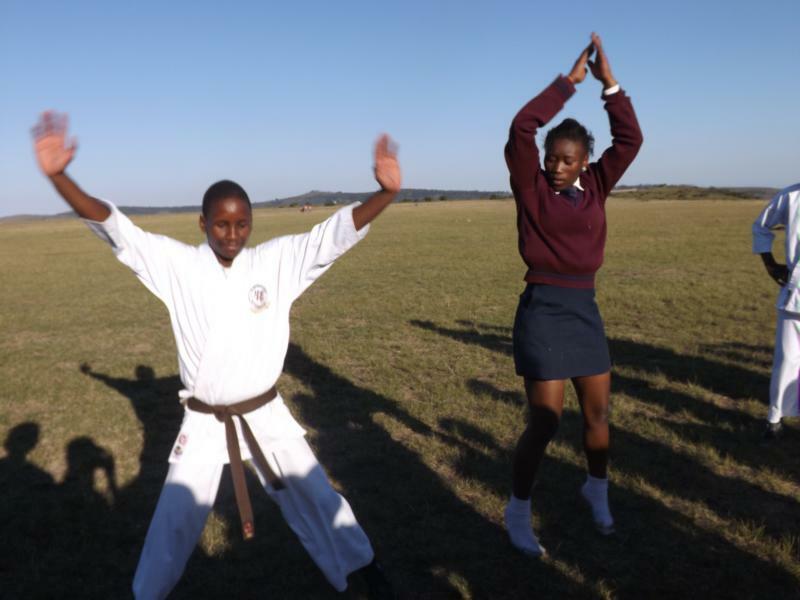 Additionally, there will be a Karate demonstration by Thando and the Joza Karate Club. The project has been a great success so far and the learners are enjoying playing sport and learning about Health and Fitness. THE was this boy he was talented.THE name of this boy is Thandoxolo. THIS boy was talented in Karate.This boy started Karate when he was 11years old.THIS boy started another Karate club in ext9.THE boy won a bronze medal. The is a guy was here on tuesday he was telling how was school, what did he do when he was young.He told us that he didn't apply for school and he just went in and they took him because he was good in sport and he was playing SOCCER.His name is CHRIS.CHRIS was playing soccer and he was good in soccer and now he is a coach soccer in K.D. He told us that school is a first thing in life we cant have a job or work without EDUCATION.EDUCATION is the key of life he told us that if we want to a girls soccer team he can come and be our girls soccer coach but he is still busy in K.D. CHRIS told us that he can find coach for us.CHRIS said that let us play a little game and we were all giggling because it was really fine spending that secend with him.